"In situations like these, the clear answer is the only answer. These monkeys will leave when we force them to leave! To not defend our town and those we love would be the only true crime. Thus is the way of the Huojin." Ji and 艾莎·云歌 met the 熊猫人 adventurers sent by Master Shang Xi in an effort to recover the four elemental spirits. After recovering Huo, Ji was unable to wake Wugou until the coming of the adventurers sent by Aysa. Afterward, Ji led an assault to the Morning Breeze Village to solve the hozen problem. When the elemental spirits were recovered, the pandaren discovered that the pain of Shen-zin Su was a thorn - The Skyseeker. Ji decided to blow up what was left of the Skyseeker, causing him to fall out with Aysa. With the battle between the 部落 and the Alliance affecting their land, Ji chose to join the Horde at any cost. To prove his loyalty, he fought in the Ring of Valor against a gronn, an ettin and a magnataur for 加尔鲁什·地狱咆哮. Imprisoned by the Kor'kron and beaten unconscious, Ji is later rescued by 艾莎·云歌 and taken out of Orgrimmar.Begging him to live, Aysa promised that the two of them could return to the turtle and be together. Ji survived and served as a liaison for the Horde and 祝踏岚 during the trial of Garrosh Hellscream, such as directing the Horde leaders to an appropriate temple for a discussion of Garrosh's defender. 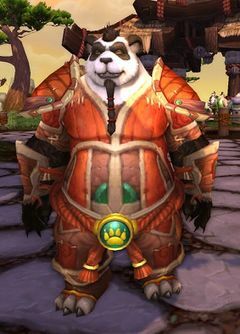 During the Mists of Pandaria beta a forum post on the Mists of Pandaria Beta Feedback forum sought to highlight what some saw as a form of sexism. Ji Firepaw greeted female characters saying "Hello, friend! You're some kind of gorgeous, aren't you? I bet you can't keep the men off of you! Join me! You and I are going to be good friends!" To men, he instead said "Hello, friend! You've got a strong look to you! I bet you're all the rage with the ladies! Join me! You and I are going to be good friends!" This form was followed by a very long discussion. A reference to the controversy was added a few patches later. During the quests where Ji is provided as a companion, other players instead see the player being followed by a generic "Huojin Monk" with an altered model. 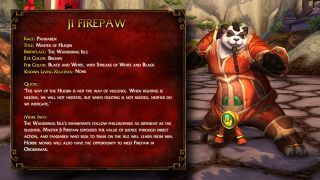 This is presumably done to make the player feel special, as if it is only they who are followed by the Ji Firepaw while everyone else gets a random monk. This is also done for the Klaxxi Paragons in the 恐惧废土, where other players are accompanied by "Klaxxi Warriors". ↑ Mists of Pandaria Press Tour. MMO-Champion (2012-03-19). Retrieved on 2012-03-19. ↑ Why is Blizzard still OK with gender inequality in World of Warcraft? ↑ Ji Firepaw Part ...huh?